Anyone who has had to contend with an uncooperative computer knows how great it is when somebody like Ethan Maguire shows up. Printer won’t work? Photoshop won’t open? Can’t figure out why the mouse won’t talk to the monitor or what cord to plug into which outlet to get Internet access, and if it doesn’t get fixed soon you’re going to miss deadline and/or the late bus? Enter Ethan, the quiet trouble shooter and problem-solver. 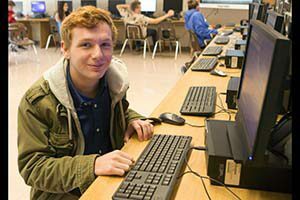 The Warwick Valley High School senior has a talent for all things technological and has become the unofficial go-to expert when teachers and classmates hit a glitch. He also likes it when things don’t work. Ethan loves computers – says they’re awesome – but he also knows that not everyone shares his fascination over how they work, or his talent for fixing them when they don’t. That’s why he does not make anyone feel embarrassed if they need his help. Art teacher Terry McLoughlin said that Ethan is a valuable asset in her Yearbook class because he is often able to fix computer problems on the spot, enabling the class to continue without interruption. He also helps out behind the scenes in the “tech booth” during school plays and productions, she said. ‘He is always eager to volunteer and help,” Ms. McLoughlin said. This past summer Ethan worked as an intern with the Warwick Valley Central School District’s technology team, honing his skills. After graduation he plans to study computer programming and software development. His goal is to work for Apple, where he hopes to develop technology that improves lives.